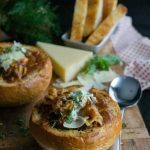 Instant Pot Lasagna Soup - What the Forks for Dinner? 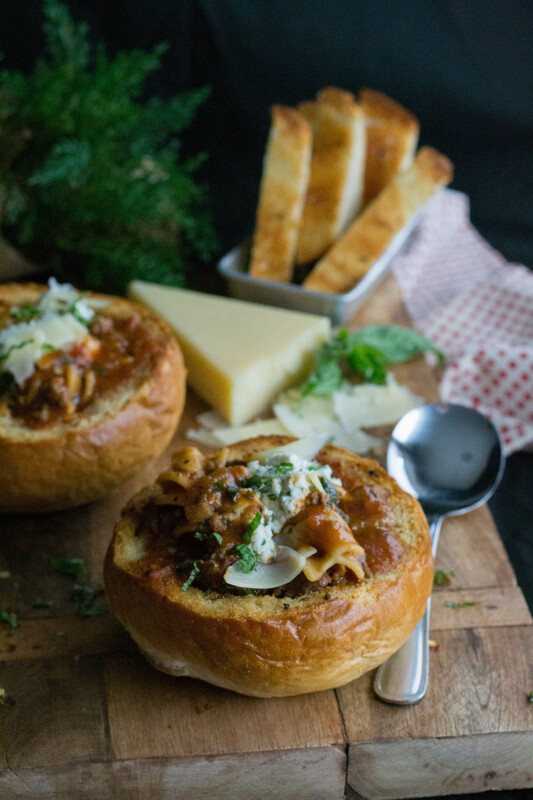 Instant Pot Lasagna Soup should have a really long title to describe accurately precisely what they are, but alas to be SEO friendly it was not to be. 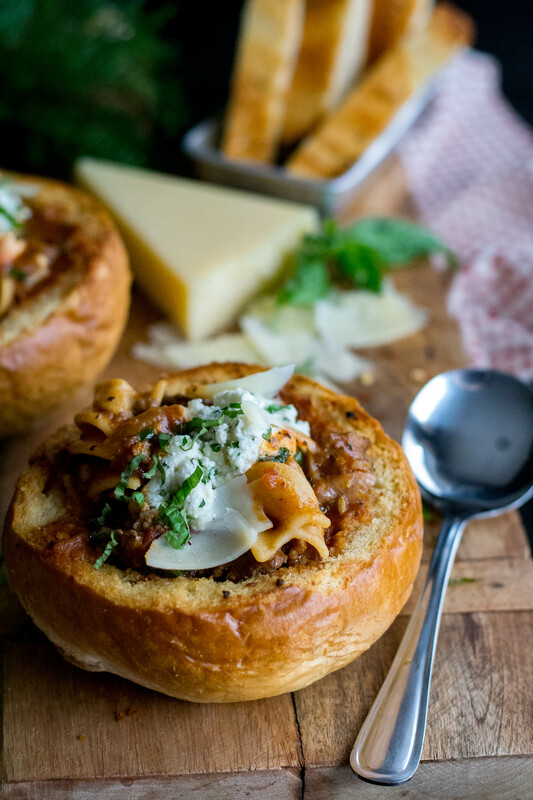 This recipe should be called Instant Pot Lasagna Soup in Crispy Garlic Bread Bowls. A mouthful I know, and in more ways than one. Keeping with the Instant Pot theme since I know many of you received one as a gift this past holiday season, I wanted to create a recipe that was homey and comforting for the dreary days of winter. Having never made pasta in the Instant Pot before I did a bit of research as I’m sure there was a trick to it…there was. It takes three times as long for the Instant Pot to come to pressure as it does for the pasta actually to cook. The pasta cooks in only four minutes, but it takes about 15 minutes for the pressure to build. Instant Pots make one-pot meals super easy. Mine has a sear feature that lets me brown the meat and onions, then without dirtying another pot transition to cooking the rest of the dish. After browning the meat, I added jarred spaghetti sauce. Bertolli makes a beautiful organic sauce that we love! No affiliate just something we really enjoy…….but if you work for Bertolli….. Using a jarred sauce makes this soup an “oh I have that in my pantry” soup. Everything in this soup qualifies as a pantry item. Ok well, I guess it depends on your pantry…lol. One thing that was not in my pantry was lasagna noodles?? Running to the local Wal Mart, just a quick trip for lasagna noodles…..what???? The pasta shelves were all but empty…really?? Perusing what they did have, I found a bag of noodles that looked like the curly edges of lasagna noodle, SOLD! Fussilloni Pasta is a Sam’s Club brand and looks like you cut the edges of lasagna noodles off. While eating our Instant Pot Lasagna Soup Tim comments on how much he liked the noodles. Using only half the bag for this dish, I can make it again (pantry item) or create something new. The biggest trick I learned from this is not to stir the noodles completely into the liquid. Brown, the meat, add the spaghetti sauce and stir to mix, then pour in the broth. Place the noodle in the pot and gently push them into the liquid until they are just covered, but do not stir them. Following the recipe, directions cook the soup for the recommended time and the recommended release. Once you release the pressure and take the lid off give the soup a good stir. Now about those bread bowls… Lasagna isn’t complete without garlic bread. I’ve said before that some of my best ideas come at the grocery store, and this is no exception. Breezing past the deli, these small sourdough rounds caught my eye, so I grabbed them and shoved them in the freezer. 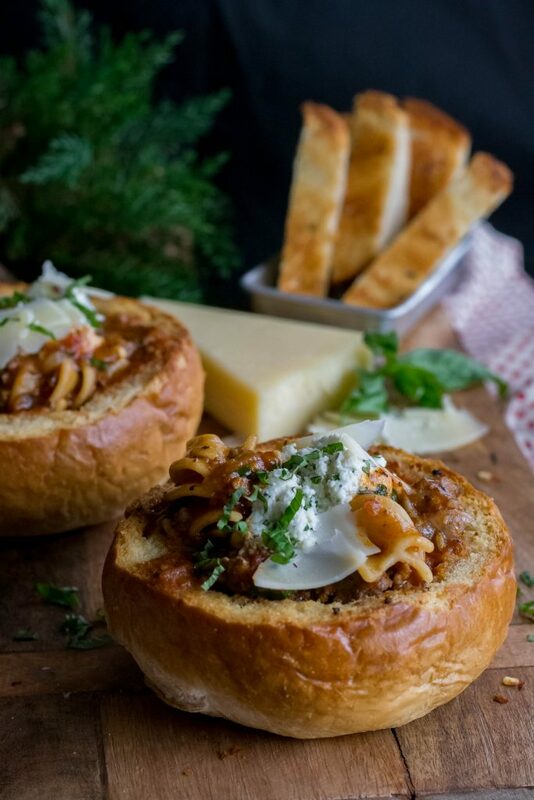 While creating the recipe for Instant Pot Lasagna Soup I remember the bread. 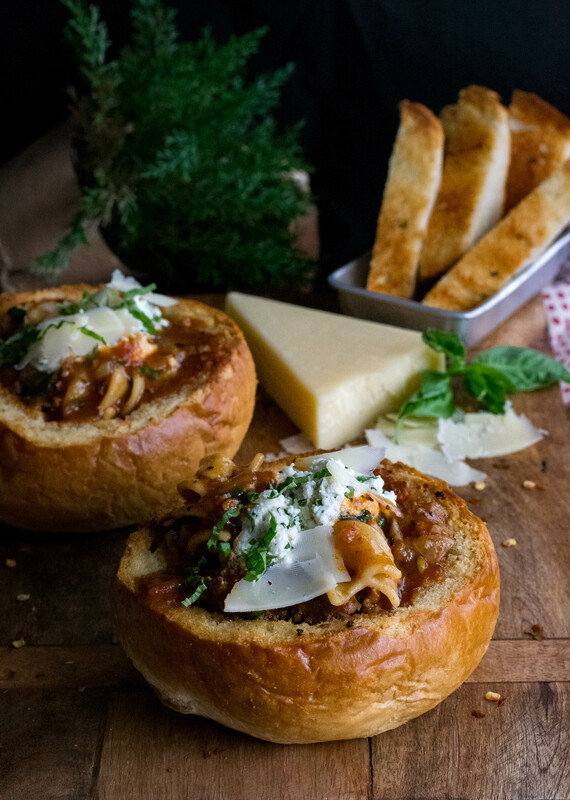 Back in the day and maybe even now bread bowls were all the rage for soups and chili’s, and I got to thinking if I baked the bowls after brushing them with garlic butter they would be the perfect vehicle for the soup. I was correct!! Crispy and garlicky the bowls worked perfectly for the soup. The addition of a ricotta parmesan mixture, extra parmesan and fresh basil and parsley for toppings… this is comfort food at its best! Using the Instant Pot makes it a one-dish meal that your family will love, so dig in your pantry and whip up an Instant Pot Lasagna Soup today! Turn Instant Pot on to sear and add olive oil. Once hot, add beef, sausage, spices, sugar and season with salt and pepper. Brown, the meat, breaking it apart as it cooks. Once browned, add the onion and garlic, and cook until onion is translucent 2-3 minutes. Add spaghetti sauce. Stir to combine. Add broth; do not stir. Break noodles into pieces, add them to the Instant Pot and push them under the bone broth so they are submerged. Put the lid on the pot, and lock into place. Set valve to seal. Cook at high pressure for 4 minutes. It will take about 15 minutes for the pressure to build, then the countdown timer will begin. After 4 minutes, let Instant Pot natural release for 10 minutes then quick release any remaining pressure. Open the pot and stir. Adjust the flavor if needed with additional salt or pepper. Stir in 2tablespoons fresh parsley and basil. Serve soup in bowls topped with 1- 2 tablespoons of the ricotta cheese mixture, a sprinkle of mozzarella, and fresh basil. In a small bowl, combine ricotta, parmesan, and parsley. Season with salt, to taste. Melt butter and stir in minced garlic. Slice the tops of the bread rounds off using a serrated knife. Set tops aside. Remove the inside of each of the bread rounds leaving about a 1-inch shell. Be careful not to make a hole in the bread. Brush the inside and out of the bread bowls with the garlic butter. Brush the reserved tops as well. Place bowl on a baking sheet and place in oven for 15 minutes or until the desired crispness. Remove and serve with your favorite soup or stew. Slice the bread tops to use as extra garlic bread. 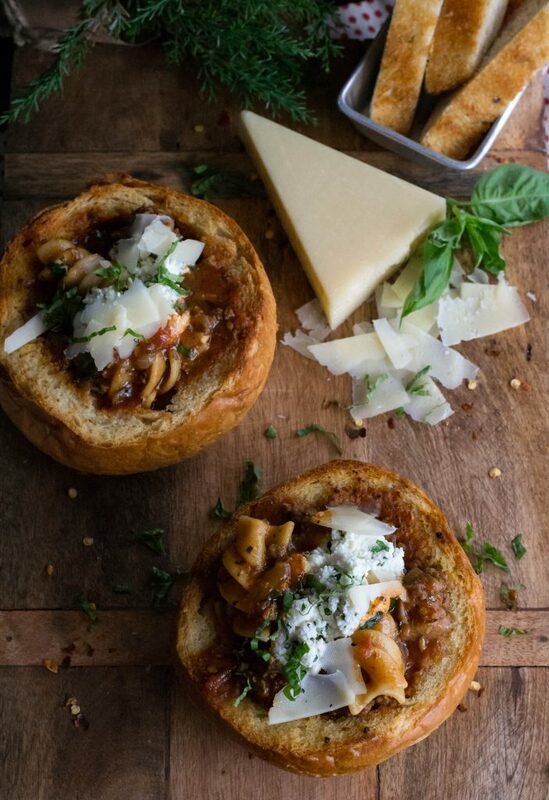 The recipe for the Crispy Garlic Bread Bowl is only for 2 servings adjust as needed.